Dicamba has been an important component of Iowa weed management systems for more than 40 years. The history of its use is somewhat unique in that its popularity has ebbed and flowed over time. The increase in herbicide resistant weeds combined with the introduction of dicamba-resistant soybean (Xtend) promises a large increase in dicamba use in both corn and soybean. This article will review the characteristics of dicamba that differentiate it from other herbicides, provide an overview of problems observed in 2017, and describe how risks can be minimized in 2018. The discovery of 2,4-D and other phenoxy herbicides in the 1940’s started the era of chemical weed management. Dicamba was first described in 1958, and registered for use in 1962. These herbicides mimic the action of auxin (indoleacetic acid), and are frequently referred to as growth regulator herbicides, synthetic auxins, or Group 4 herbicides (Table 1). They bind to the receptor for auxin and initiate transcription of genes involved in cell growth. While plants can closely regulate concentrations of auxin within cells, they lack this ability with the Group 4 herbicides. Presence of Group 4 herbicides in cells results in deregulation of numerous important processes, resulting in abnormal growth and/or plant death. Table 1. Chemical families that interfere with auxin activity (Group 4 Herbicides). Nearly all Group 4 herbicides selectively control broadleaves in grass crops. The exception is quinclorac which is used to control certain weedy grasses in rice and turf. There is a wide range in selectivity among the products, and they are commonly used in combination to provide a broader spectrum of weed control. A combination of 2,4-D and dicamba was the most popular postemergence program in Iowa corn production in the 1970’s and early 1980’s. Dicamba was more active on smartweed than 2,4-D, whereas 2,4-D provided better control of velvetleaf. Group 4 herbicides vary widely in soil persistence, and hence, length of residual weed control. Generally, the phenoxy herbicides have the shortest half-lives of the Group 4 herbicides, whereas the pyridines are most persistent. An advantage of dicamba over 2,4-D for use in resistant soybean is dicamba’s longer half-life (14 days) compared to 2,4-D (6 days); however, the half-life of dicamba is less than half of most preemergence herbicides. Thus, the value of dicamba as a preemergence herbicide is limited for managing weeds with prolonged emergence patterns, such as waterhemp. Group 4 herbicides induce plant responses at lower fractions of use rates than most other herbicides. 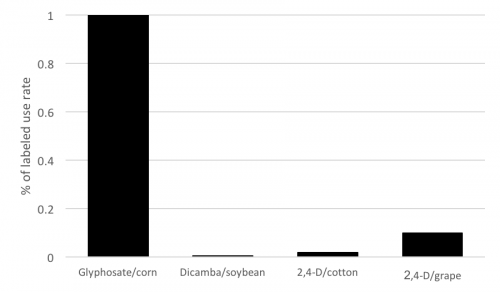 For example, it takes 1% of the standard glyphosate use rate (0.75 lb/A) to injure corn, whereas 0.005% of the dicamba use rate (0.5 lb/A) can injure soybean (Figure 1). Due to this high activity, injury to sensitive plants outside of treated areas has been a problem since the introduction of Group 4 herbicides. In a 1971 bulletin, Dr. Ellery Knake, extension weed scientist at the University of Illinois, discouraged the use of dicamba in Illinois due to the sensitivity of soybean to the herbicide. Improvements in application technology have reduced, but not eliminated, problems with off-target movement of the Group 4 herbicides. Figure 1. Fraction of labeled rate required to cause visible injury on susceptible species. Adapted from Bhatti et al. (1996), Everitt and Keeling (2009) and Solomon and Bradley (2014). Another distinguishing characteristic of dicamba and certain other Group 4 products is their relatively high vapor pressure. Herbicides with high vapor pressures may evaporate following application, resulting in off-target movement even when the applicator uses appropriate application practices. The combination of vapor loss and the high sensitivity of certain plant species to dicamba results in a higher risk of off-target injury than with most other herbicides. The following factors influence the potential for dicamba volatilization following application. Temperature. The potential for dicamba to volatilize increases as temperature increases. A threshold of 85° F is frequently cited as the temperature where caution should be used when applying dicamba in the vicinity of sensitive vegetation. Minnesota and North Dakota recently prohibited applications of dicamba if air temperature is forecast to exceed 85° F the day of application due to increasing risk of volatility. Application surface. The amount of dicamba that volatilizes varies depending on the characteristic of the surface it lands upon. Behrens and Leuschen (1979) reported that approximately 35% more dicamba volatilized off corn and soybean leaves than from a silt loam soil. Thus, there is greater risk of volatilization with postemergence applications when significant herbicide is intercepted by the crop rather than the soil surface. Formulation. Almost all postemergence herbicides are weak acids, compounds capable of donating a proton (hydrogen ion). These herbicides are often formulated as a salt of the parent acid, replacing the hydrogen with some other positively charged ion (e.g. dimethylamine, potassium, etc.). There are a variety of reasons why salts of the parent acid are used rather than the acid itself, but improving compatibility with hard water and tank-mix products is a primary reason. The volatility of dicamba and certain other herbicides is also influenced by formulation. Several formulations of dicamba have been introduced with the intention of reducing the risk of volatilization. The parent acid of dicamba is the form of the molecule that volatilizes following application. Low-volatile formulations such as Clarity, Engenia, and Xtendimax with Vapor Grip Technology are intended to reduce the amount of dicamba disassociating to the parent acid. Independent research has verified these formulations reduce volatilization compared to the original dimethylamine salt used in Banvel, but they do not eliminate these losses. In December the Iowa Department of Agriculture and Land Stewardship (IDALS) reported there were 253 pesticide misuse complaints in 2017, a record number. This increase was largely due to 157 off-target injury complaints associated with growth regulator herbicides, the majority involving dicamba. It is important to recognize the number of formal complaints to IDALS is a small fraction of total problems associated with pesticide applications. At the time this article was written IDALS had not released the breakdown on the percentage of complaints associated with contaminated spray equipment, particle drift, and volatilization. Most people involved in investigating dicamba complaints acknowledge that multiple avenues of dicamba exposure were involved with off-target injury. Problems associated with contaminated spray equipment and particle drift can be minimized through better training and improved decision making; however, risks associated with volatilization are not easily managed since vapor movement is determined by the environment following application rather than actions of the applicator. There has been considerable debate on how to reduce off-target movement associated with dicamba use in soybean. The United States Environmental Protection Agency (EPA) introduced several important label changes for the new products registered for use on dicamba-resistant soybean. These products are now classified as Restricted Use Products (RUPs). This classification requires users of the products to be certified applicators, and also requires recordkeeping above-and-beyond those necessary for other RUPs. In addition, applicators of the products will be required to complete dicamba-specific training prior to use. The maximum wind speed allowed for applications was reduced from 15 MPH to 10 MPH, and applications are limited to hours between sunrise and sunset. Label language regarding sprayer cleanout and avoiding applications near susceptible crops has been expanded. These label changes are appropriate, and should reduce problems associated with particle drift and sprayer contamination. However, they do not address the issue of off-target movement associated with dicamba volatilization. Due to concerns regarding volatilization of dicamba, ISU Weed Science recommends that dicamba only be used preplant or preemergence in dicamba-resistant soybean. Preemergence applications of dicamba reduce the value of dicamba in managing waterhemp, but in our opinion, the risks associated with postemergence applications exceed the weed management benefits. While early postemergence applications made in May would reduce the volatility risk compared to June applications, label restrictions regarding wind and rain would frequently delay applications into high-risk scenarios (i.e. temperatures above 85° F, nearby soybean reaching sensitive stages). In summary, dicamba has been a popular herbicide in Iowa corn production for nearly 40 years. Farmers have learned how to manage dicamba in corn while minimizing risks associated with off-target injury. Postemergence use in dicamba-resistant soybean presents a much greater challenge due to higher temperatures and more advanced development of adjacent sensitive crops, particularly soybean. Failure to significantly reduce complaints associated with off-target injury may result in further restrictions on not only dicamba products, but also on other pesticides used in crop production. Behrens, R. and W. E. Lueschen. 1979. Dicamba volatility. Weed Sci. 27:486-493. Bhatti, M.A. et al. 1996. Wine grape response to repeated exposure of selected sulfonylurea herbicides and 2,4-D. Weed Technol. 10:951-956. Ellis, J.M. et al. 2003. Rice and corn response to simulated drift of glyphosate and glufosinate. Weed Technol. 17:452-460. Everitt, J.D. and J.W. Keeling. 2009. Cotton growth and yield response to simulated 2,4-D and dicamba drift. Weed Technol. 23:503-506. Solomon, C.B. and K.W. Bradley. 2014. Influence of application timings and sublethal rates of synthetic auxin herbicides on soybean. Weed Technol. 454-464.